Caleb Ekuban chases the ball after coming on as substitute in Leeds United's defeat at Middlesbrough. After the blip of a win over Brentford it was back to reality for Leeds United as they produced a poor display all over the pitch in a 3-0 defeat to Middlesbrough at the Riverside Stadium. The big efforts of the home club to get the game off paid off for them as they got a comfortable three points to keep their hopes of a top six finish very much alive. For Leeds it was back to square one and where head coach Paul Heckingbottom goes from this sorry show is anyone’s guess. Middlesbrough did have some luck as one of Patrick Bamford’s three goals was clearly offside and another borderline offside. They could have also conceded a penalty, but they were clearly the better side and anything other than an easy win for Boro would have been a travesty. Fielding an unchanged side from the one that won against Brentford, United did start okay. They were straight onto the front foot, but were unable to create any chances in the first 10 minutes and it was Boro who had the first serious shot, Patrick Bamford’s angled cross-shot being saved by Feliz Wiedwald’s feet. Former Leeds player Jonny Howson then saw a tame shot comfortably saved by the Whites keeper. United sprung a good break on 13 minutes when Ezgjan Alioski’s run down the middle had the hosts back pedalling and from a desperate defensive challenge the ball broke to Saiz just inside the box only for the Spanish playmaker to fire over. Ben Gibson headed wide under pressure from a corner at the other end before Leeds enjoyed a spell of pressure that ended with Pontus Jansson’s diving header going wide from a corner. Middlesbrough broke the deadlock just after the half-hour when defenders backed off Stewart Downing, allowing him to play a low ball in for Bamford to score with a smart finish. It was 2-0 six minutes later after more poor defending was exposed. Adama Traore’s run through the middle was not checked with Kalvin Phillips and Eunan O’Kane pulling out of tackles and he played Bamford in on an angle. The striker’s shot was straight at Wiedwald, but the Leeds keeper let the ball go through him and his team faced another uphill challenge. It could have been worse as Gibson headed a good chance wide from another home corner, but it stayed 2-0 to half-time. Head coach Paul Heckingbottom changed things at half-time, bringing on Ronaldo Vieira and Adam Forshaw for Phillips and Alioski as well as swapping his full-backs over in a bid to stop the threat of winger Traore. They did improve initially as Jansson headed two corners over despite being man-handled in the area and referee Darren England choosing not to notice the amount of contact going on. But Boro still carried a threat as Downing hit a shot from range wide and Bamford was almost in, but for a great saving tackle by Liam Cooper. 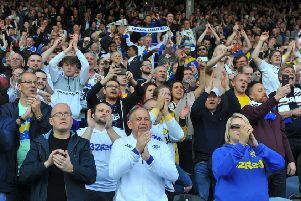 The home team made it 3-0 on 68 minutes when Traore’s shot was only half blocked by Jansson the ball fell kindly for Bamford to complete his hat-trick. He was offside when the initial shot came in, but no flag went up and that summed up Leeds’ awful night. More Boro goals could have followed in the next six minutes as George Friend fired wide when well placed in the box and Daniel Ayala headed wide from a corner after being left unmarked. There was no sign of any comeback from Leeds, although they did finally manage an effort on goal of sorts in the 85th minute as substitute Caleb Ekuban was stretching to reach a Forshaw long pass and directed the ball straight to home keeper Darren Randolph. In truth this was a night to forget and does not bode well for the Whites’ next game against leaders Wolves. Middlesbrough: Randolph, Shotton, Ayala, Gibson, Friend, Traore Besic, Leadbiter (Clayton 43), Howson, Downing, Bamford (Cranie 90). Leeds: Wiedwald, Berardi, Jansson, Cooper, Anita, Dallas, O’Kane (Ekuban 69), Phillips (Forshaw 45), Saiz, Alioski (Vieira 45), Lasogga.